A ski-bum-turned-desk-jockey, Ian Anderson is a big man behind the scenes. After all, he helps give a voice to active lifestyle brands as a partner and public relations director at Backbone Media. But all that office time hasn’t stolen his adventure time—you can find Anderson chasing his wife, Sari, a world champion adventure racer and accomplished ski mountaineer—around the local trails of Carbondale, Colorado, with their two young children. 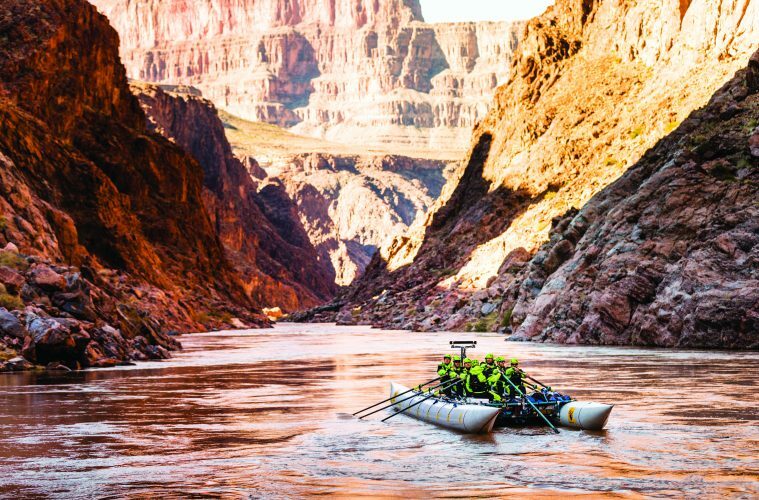 This January, he took it up a notch: A former river guide, Anderson joined members of the Vail Valley-based U.S. whitewater rafting team for a speed record attempt down the Grand Canyon. The film chronicling the trip, “The Time Travelers,” debuted at the 5Point Film Festival in May. You promoted summer events with the Vail Valley tourism bureau for seven years and then joined Backbone Media in 2006. How did that come about? I met the founders Penn [Newhard] and Nate [Simmons] on a media trip and enjoyed what they had to share about their vision for Backbone. They afforded me the opportunity to do what I really wanted to do, primarily the PR aspect, working with the media and promoting active lifestyle brands. How did you get involved with the “The Time Travelers”? I have bunch of friends on the men’s and women’s U.S. national whitewater teams. A lot of the guys had read Kevin Fedarko’s book, The Emerald Mile, which chronicles the original speed run back in 1983 [that record of 36 hours, 38 minutes for the 277-mile run stood until it it was broken twice in a week in 2016 and stands at solo kayaker Ben Orkin’s 34 hours, two minutes]. The guys thought that with proper planning and the right boat, they could beat the record. [Backbone client] Chaco got excited about the possibility of documenting and supporting the trip. How’d you join the team? The raft team consists of six core guys. But as we designed this experimental boat, the configuration called for eight people on the raft. So I got cajoled into joining the team, even though I’ve been more of a desk jockey for the past 10 or so years. I had a year to train and readjust my whole body to prepare. The record fell out of reach about 20 hours into the trip, at the infamous Lava Falls rapids, when you were actually on pace to beat it. What happened? From the light on my headlamp, I could see the faces of the guys who are driving the boat as I am rowing backwrds. Going into the rapid, everyone was psyched. We were on line and feeling good. And then there was a huge wall of whitewater that basically buried John Mark [Seelig], who was next to me. As soon as we hit that wave I heard a crack and then a sound like a jet engine. We quickly figured out it was air coming out of one of the tubes. What has response to the film been like? The 5Point Film Festival premiere with 700 people in the room was incredible. The reaction I’ve heard most commonly is, “It’s a huge bummer you guys popped the boat and didn’t get the record, but the story is much better because of that.” The fact that we had this challenge and we failed in our overall goal made it far more interesting. What do successful outdoor lifestyle brands do well? Authenticity is paramount, especially when working with outdoor lifestyle brands. While many of the brands in the outdoor space we work with have grown well beyond their core audience, I think it’s critical that you maintain the authenticity in your storytelling. You also need your brand to be approachable. Are there lessons from brands that didn’t do this well? The whitewater kayaking world exploded in the late 1990s. Professional kayakers were kind of the rock stars of the outdoor world. And that almost disappeared overnight. Some people have pointed to the fact that the marketing of whitewater kayaking was centered around people running big waterfalls and huge whitewater—it was completely intimidating to the average person. That’s the fine line you need to strike as a brand. You want to be aspirational without being intimidating.